Your child's adult front teeth start to come in at age 7. Cosmetic problems can wait, but some hidden problems may mean it's time to see an Orthodontist. Your 7 year-old’s new teeth may be a little crowded or severely crowded … or somewhere in between. And if you are like most parents, you wonder about the right age to get help. Too early and you might be afraid of getting something unnecessary. Too late and you worry about leaving your child in a bad situation. So what should you look for at age 7 that might spoil your childs nice smile? At the end of this page, one of two things will happen. The first is that you could decide that it’s not the right time for your child to get help. If that’s the case then we will look forward to seeing you in a couple years. On the other hand, you may find out that it’s the right time for your child to get help. 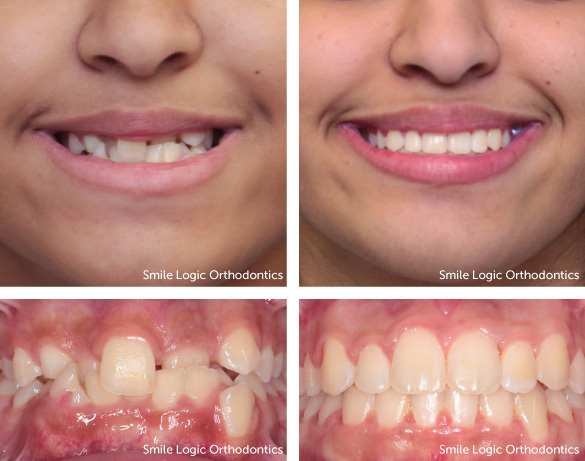 If it’s time, you may want to book a free consultation at Smile Logic. 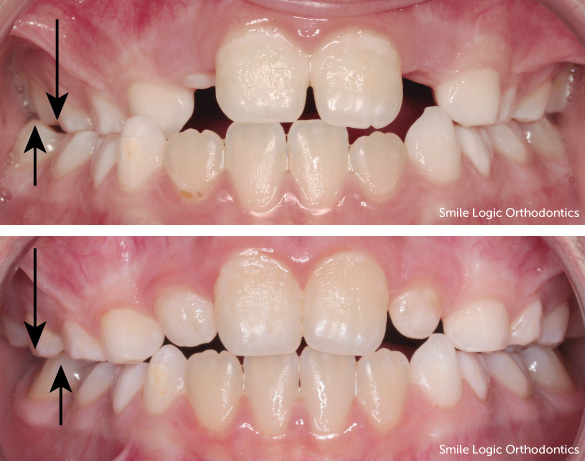 Severe crowding corrected with a palatal expander followed by full braces for 26 months. Actual patient of Dr. Viechnicki. You might see a crowded top tooth that bites behind a bottom tooth. Most parents ask us to help with that so the front tooth won’t chip. 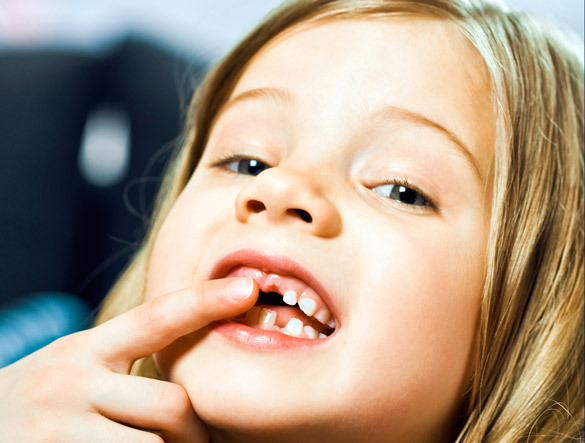 When an adult tooth comes in, it loosens the baby tooth it replaces. The problem to look for is an adult tooth that loosens an extra baby tooth. The most likely tooth for this to happen with is the permanent lateral incisor. When it comes in it can loosen the primary canine. If this isn’t corrected, everything shifts over and we see the extra-crowded neighboring tooth get stuck, or worse, torpedo into the neighboring adult teeth. That would cause the roots of the adult teeth to shorten. In severe cases, the root of the adult teeth gets so short that the tooth falls out. Crossbite corrected with palatal expansion in 6 months. Actual patient of Dr. Viechnicki. The third problem you would see that you would want to get help with is if your child’s top jaw is narrower than the bottom jaw. Left uncorrected, this increases the risk of crowding, facial asymmetry, sensitive worn teeth, and lifelong TMJ pain. We see better results at age 7 than any later age. The last problem you might see is if the top teeth are far out ahead of the bottom teeth. Some parents ask us to fix this problem - and the reason we would do that is if we were afraid of the front teeth fracturing during sports or rough housing. But most of the time, this is something that can usually be corrected better as your child goes through their growth spurt. There are much more eloquent terms, but we can categorize this as weird stuff. These are a set of problems that, as a parent, you probably wouldn’t be able to see without an X-ray. Obviously, with those sorts of problems you would want to know about them as soon as possible. Is age 7 the right time to visit the orthodontist? If now is not the right time to for your child to visit us, then we should to wait to meet. On the other hand, if you think it’s the right time for your child to get help, you will want to call 732-274-2211 to book a free braces consultation. Dr. Bryon Viechnicki, DMD, MS is an orthodontist (New Jersey Specialty Permit Number 6313) serving South Brunswick, NJ including Dayton, Monmouth Junction, Kendall Park, Cranbury, North Brunswick, Monroe, and Plainsboro.